A few days ago I posted a thread concerning changing the pots in my Epi dot studio. As I planned the project I read about conductive shielding paint, and how it can help eliminate stray RF from entering my signal path. Since I own a pretty cheap Epi, I figured it would probably be more prone to picking up these stray noises. So, some kind of conductive shielding will be introduced after I take out my stock pots. I have two options: (1) conductive shielding paint, or (2) conductive copper tape. Does anybody here have some first-hand experience with these products, and which one would be my best option? Any advice would be greatly appreciated. Thanks in advance! I figured it would probably be more prone to picking up these stray noises. The point is does it hum though? I'd think about why you want to do it- it will probably effect your tone, maybe making it darker (of course you may like that). If it does hum though- particularly around lights or if you practise near a computer then it may be worth it. I'd say go for the tape (copper). You can remove it if you want and its less messy. You can get self adhesive sheets which are the easiest. Depending on the type of glue (whether it conducts) you will need to solder the sheilding at the joints (not the whole joint- just a blob to connect them). Also leave an overlap underneath the plate so that the sheilding on the plate is earthed also. I also forgot to state the main reason for the shielding: I'm wiring my pickups so they can be used as both a humbucker and single coil. The single coil is bound to be sensitive. IMO, the paint would be a more effective solution. I don't think it will affect my sound a whole bunch, just clean it up. You won't eliminate single coil hum just by shielding the cavity. Have you considered wiring the pickup in parallel rather than as a single coil. I have this on my LP and it gives a great single coil tone but without hum (the mid position on a tele is two coils in parallel). I don't think theres much difference between paint and tape. I've used both and not noticed any difference. The paint is easier to apply in difficult areas (I've used it in a tele for instance) but it is permanent (obviously you could probably find a solvent to get it off- but would probably strip the finish aswell). I think you'll find the consensus is that it will effect tone. But it depends on the rest of your kit to whether you'll have a noticable loss of tone. Please let me clarify. I don't want to eliminate my own guitar's hum. I'll be gigging soon, and will be next to/hooked up with a lot of other electronic signals. This is to shield my guitar circuits from unwanted noise. How will shielding affect tone? I really don't think it will have any effect whatsoever. By shielding, I'm not trying to affect the sound/tone/hum/harmonics of my own guitar. I'm trying to keep my guitar's unique sound from being corrupted by outside interference. If anything, the tone will be improved somewhat since it doesn't have to compete with other signals, thus improving its efficiency. It kind of acts as a capacitor- but one that you can't control. This rolls off the top end. Its a toss up between loss of treble and muddy tone and picking up stray magnetic fields. On a tele or strat it can work great as theres a lot of treble. LPs are bassier beasts and I'm normally trying to find a way of getting abit more top end from mine. Probably be fine when the coils split but might make your dual coil neck tone muddy. Sorry- I don't mean to sound preachy about this but you asked for advice. I'm not saying don't do it, I'd just see if you have a problem first before you take the plunge because it does have drawbacks. Sorry if I sounded too argumentative. Your advice is greatly appreciated. I decided to go with the tape. I love how the copper dresses up the cavity, makes it look all metallic and shiny. Plus, it's temporary, so if I don't like how it affects my tone, then no problemo, it'll come off. I'll post feedback on these forums for others considering this project. I received the Les Paul wiring kit yesterday, which included 4 pots, wires, output jack, and pickup selector switch. Today, I ordered the push-pull pots, so now I'll have 2 spare pots. This is gonna be a cool little project. Hopefully I can take pictures with my cell phone. Good luck with the rewire- those push-pulls can be pretty fiddly to wire up! I personally like the shielding paint, if you have ever seen the insides of a "Cunetto" they are painted, it looks better and is permanent. I would check your cavity first. I have an Epi LP 100 (selling) that has conductive paint in there already. It is not the best shielding as it has around a 2K Ohm resistance across the 2 furthest points of the cavity route and around a 1K Ohm resistance from pot to cavity. I would think putting shielding over that would cause more capacitance problems than anything. May have to remove the conductive paint to install better shielding or make sure the conductive paint is not grounded to the system. I'm looking at the control cavity, and it looks like someone spray-painted matte black paint in there(very very thin coating). Running my fingers against the surface, it feels like bare wood. It doesn't look like shielding paint to me(-but what do I know, I've never seen an application of it before). The more I think about it, it just looks like overspray from the original manufacturing where it was originally painted. The cavity was still bare from the routing process, and the primer got in there from the first spray. The matte black is the conductive paint. Well, it'll be a god-damned double shielded guitar then. I already ordered the kit, so we'll see what happens. I have good feelings about this. 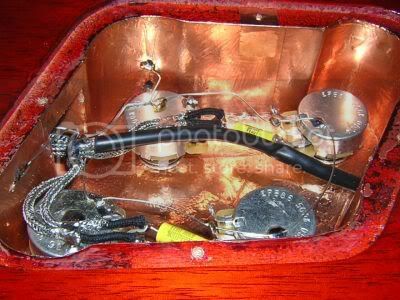 The inside of my 04' Gibson Les Paul Classic. I only actually did this because the cavity looked like it had been carved out by a blind man with a spoon and it bugged me so much (even though it was hidden) that I had to tidy it up. All this talk of loss of top end............well to be honest, it really is negligable. It really does make such a tiny difference I doubt if many people would be able to hear the difference. Especially when you're cranked up and jammin' with a band.